April was a busy month for forestry interests with the Santa Cruz County Board of Supervisors. On April 14, the Board of Supervisors heard testimony regarding a Working Lands Resolution. (Working lands resolution agenda item 04-13-15) This resolution essentially lists the benefits of working lands, notes that these lands are at risk of conversion, and declares that it is the goal of the Santa Cruz County Board of Supervisors to “work collaboratively to protect and enhance the County’s working landscapes” by supporting both the economic and the environmental aspects of working lands. Working Lands are defined in the resolution to include “farm, forest and rangelands” and their benefits include the public trusts values of providing clean water and air, habitat for local native plants and animals and carbon sequestration sinks while at the same time providing food and fiber, jobs and tax revenues that support our local society. Several agricultural groups weighed in in support of the resolution, including the Farm Bureau, the Resource Conservation District, the Santa Cruz Land Trust, and Cal Poly. CCFA submitted a letter in support highlighting the unique role of working lands in providing essential services like clean air and water at no cost to the public while contributing to our local society by providing jobs and tax revenues (Working_lands_resolution_letter from CCFA). It should be noted at this point that resolutions are nonbinding and nothing in this resolution sets policy in any way. In the opinion of these environmentalists, a conversion to parkland or the imposition of a conservation easement should not be considered a threat to working lands. Only a conversion to “developed” land, like housing or business development should be considered a threat. They choose to ignore the social impacts of removing land from the tax and business bases. The supervisors deliberated about this question, then chose to go forward with the resolution as written. It passed unanimously. The environmentalists were furious, disproportionately so for what is a non-binding resolution that sets no policy. It makes us wonder what is going on in the background. On April 21, the Board of Supervisors received under the consent agenda an Open Space District Status Report (Open Space District Status Report April 2015). The report was submitted by Fred Keeley, Project Convener of the question of whether and how Santa Cruz County should create an Open Space District. (We’re not sure what a Project Convener is. It certainly is not a County employee, since Mr. Keeley retired from the County last year, but somehow it rates him a free office on the 5th floor of the County building with easy access to the supervisors.) 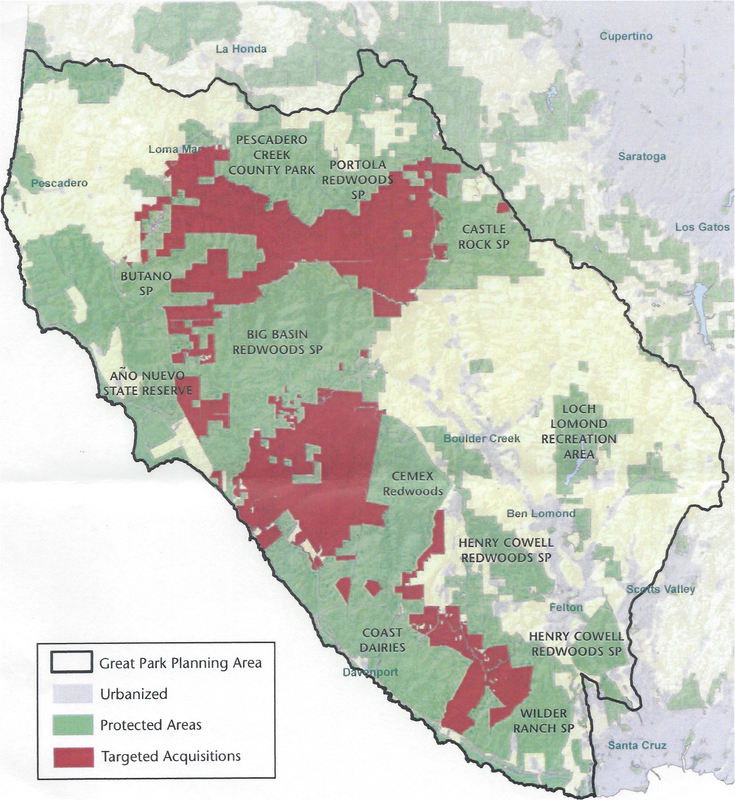 This report supposedly addresses the status of defining the establishment of an Open Space District for Santa Cruz County. Perhaps the most interesting part of this report is that it really doesn’t say anything. Based upon the institutional record of the area’s various open space districts, in which land acquisition is generally pursued over maintaining already acquired lands, the various holders of working lands find this a matter of concern. Fred Keeley is not only the Open Space Project Convener, he is also the President of the Sempervirens Fund, which has a vision of the Great Park, whereby the Fund hopes to consolidate the greater portion of the redwood lands of Santa Cruz and San Mateo Counties into their management goals by purchasing land, conservation easements and timber rights. Imagine how much simpler this would be if Open Space District funds could be used instead of Sempervirens Fund’s funds. Now let’s look back at all the angry environmentalists from the week before who wanted to extract conservation easements and conversions to parkland from the risks to working lands. It’s not that hard to make the connection. It was clear the Board was also uncomfortable with the lack of substance in the status report. They voted to readdress the issue on the August 18 Board of Supervisor’s meeting, when, hopefully, the parameters of the Open Space Project are better defined. After testifying, CCFA members and other working land advocates had a chance to chat informally with Jeff Gaffney, Director of the Parks Department. We had a chance to ask what his department really needs, and he said new land is about the last thing they need; instead, they desperately need money to maintain and develop the parks they already have. They can’t even keep their current bathrooms in good repair, much less consider developing new picnic grounds, camp sites or recreational equipment. This is something we should all keep in mind as the Open Space Project develops. If existing public lands can be developed and more facilities provided, the pressure to convert private lands to parks should ease. Remember the date – August 18 for the next hearing before the Santa Cruz County Board of Supervisors about the Open Space Project.